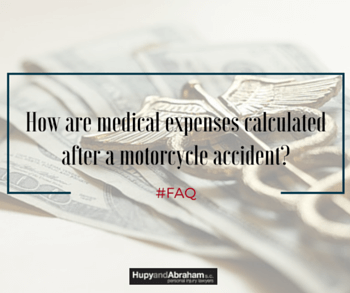 Recovering Medical Costs After a Motorcycle Crash | Hupy and Abraham, S.C.
“Medical expenses” is a broad term that may include more than you think if you have been hurt in a motorcycle accident. In order to recover fair damages for all of the medical expenses that you have incurred—or that you will incur—as a result of your accident injuries you will need to understand everything that the term includes. Additionally, you will benefit from having an experienced motorcycle accident lawyer explain your losses to the insurance company or to the court and advocate for your full recovery. Otherwise, you might not ask for and you may not receive the fair damages to which you are legally entitled. Of course, you will need to prove that each and every expense was made necessary by the injury that you sustained in the motorcycle wreck and that it is reasonable. You should anticipate that the insurance company or defendant is going to dispute your calculation of medical expenses and try to pay you only a fraction of the costs you incur. Accordingly, it is important to have accurate documentation of your costs, to have a reputable doctor who can provide a medical opinion as to your future medical needs, and to have an experienced motorcycle accident attorney fighting for your just recovery of medical expenses and other motorcycle accident-related damages. To learn more, please download a free copy of our book, The Ultimate Guide for Motorcycle Accident Victims and please contact us today via this website.